Last week's snow storm brought us 15-inch snow; today's hail storm brought us slippery and smudgy roads. It was just after church. My senior Andrew was sending a friend to Payless and was on the way back. I was still in the church waiting for Andrew to fetch me back. Suddenly i received distressed call from him; he told me he was involved in a minor accident. I was shocked, both by the news and by his oddly calm voice. As he explained, I learned that his car skidded at a corner and drove straight into the snow-covered sidewalk path. The snow was so deep that his car was stuck. Luckily he was unhurt. I quickly asked Andrew Ng and Dodoi (church members) for help. The hailstorm was still pelting down like mad when we reached the scene. Andrew's car was driven deep into 10-inch snow, not the soft flurry kind but the hardened crystallized kind. The 3 of us pushed with all our might while Andrew shifted into the reverse gear and stepped on the gas pedal. The car vroomed and bellowed but the wheels did not move at all. We tried to remove the snow below the car but to no avail. We tried to push the car again for 3 times but to no avail too. In the end, Andrew called a towing company. Andrew Ng and Dodoi went back to the church while I waited with Andrew for the towing truck to arrive. We waited for an hour. During that time, there are actually 2 passing cars who stopped by and proffered help. And a police patrol came by too. We're just sitting in the car listening to music while watching the ice plunking down on the windscreen and melting away. Other passing cars were so extremely careful while driving pass us, as if we're a reality advertisement on road skids. And Andrew said he was merely driving at a speed of 20 miles per hour when he skidded. Tough luck. Finally, the towing truck pulled Andrew's car out. $50 spent and shoes soaked wet thereafter, we reminded ourselves to be satisfied what we have experienced, and went for dinner. Met Maylin at Harrison Grill doing her programming homework. She showed us this photo of frosted pine tree taken after the snowstorm last week. It looks so magical that as if it's straight from Disney cartoon. It was something wonderful, considering after we just had experienced how bad Indiana's crazy weather can be. 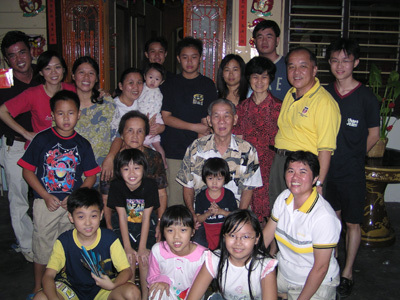 In the past, Chinese New Year had been a much awaited holiday, when I could lay back and sleep and enjoy the sumptuous reunion dinner with my Dad's family, followed by days of visitings and festive cheers (not to mention lot's of angpaos haha). That aside, I was touched today by several people's assistance and help. I think they show total relentless, selfless spirit of unity to make our event a success. 1. Thank you Andrew and Malcolm in assisting with the power short circuit crisis. To be honest, when I was informed about the crisis, the first person I think of to ask for help is Andrew, since he's an ECE Masters student. He was already up and going about checking the extension, finding the source of the problem and mending the fusebox together with Malcolm and Boon. 3. Thank you Pei Shan who willingly shared the burden of the committee (aka cooking and cleaning) although she's not part of the committee. Thanks to her 'brother' Sam too for helping out in the cleaning process. 4. Thank you Frank and Hui Yi and I'm sure lots of others who came into the kitchen and help out with the last step of preparation as well as with serving the food. 6. Thank you Maylin and Huey Sywu. You both can consider being Grammy hostesses. 7. Thank you Wooi Chen, Suan Aik and Winnie, for their help in preparing the food, and doing the multimedia presentation. You guys should consider asking Ube for posts in the committee haha..
8. Thank you Boon for organizing all this. 9. Thank you everyone for your support! I was happy because we earned a bit of profit this time round hehe..
After the event, I called back home. It's great to hear all the familiar voices again! I suddenly had an urge to go back home instantly and enjoy a sumptuous dinner with the people I missed so much. Wah, homesick liao! 1. It snowed non-stop from 7am to 2am 4am (and counting) the next day. 2. A snow recess is announced and classes are canceled for 24 hours. 3. Traffic is halted and a bus can drift naturally at 90-degree corners without the driver having drifting skills. 4. You can see snow drifts on the road, in the air, virtually everywhere. 5. You realize that your face is constantly being bombarded with mini cannon balls, and you are eating snowflakes. 6. Everything within a mile is filled with white fog. 7. A 6-inch snow becomes 10-inch after 1 hour. 8. Students make snowmen outside dorm due to boredom. 9. Students go snowboarding up a small hill near the dorm due to excitement (despite the bitter cold and reason no.5). 10. You have this view imprinted in your mind and remind yourself, this doesn't happen every day. FYI both pictures are taken at the same spot at the same time (around 4am, it still is snowing!). The top is without flash; the bottom, poor flash. I like trees with traces of snow on its branches! Bear kena kick-@$$ed by Hoosier Horsie! For the first time in history, the Indianapolis Colts won a Super Bowl championship! Amidst the inebriating seratonin in the bloodstreams of Colts fans, there's something more to celebrate for: the epitome of TV commercial creativity! Can A Young Horse Pawn a Grizzly Bear? Okay it's just been 2 days since my last post and here I am blogging again. I need to curb this incessant yet sporific blogging habit. Not to mention I still have an exam on 8 chapters of genetics tomorrow. So what brings me here to my digital asylum for some creative writing about a battle between a young horse and a grizzly bear? It's the 41st Super Bowl Game, that's why! I'm not really into football fandom (both american version and elsewhere's) but since the past week my roommate had been volubly high about Indianapolis Colts and its chances of winning the first super bowl ever for the state team, I was infected with the fever also. Of all the players in Colts, I remember Peyton Manning the most, the highly celebrated quarterback for the Young Horse team. Opposing Colts in today's Super Bowl is Chicago Bears, not famous for its quarterback but for its impregnable defense lineup. As I am typing this sentence, the game has commenced for 10 minutes, and the Bears had done a magnificent touchdown in the first minute, drowned by the cheers of Bear fans in my neighbors' rooms and also by my roommate's super loud cursing and groans. In West Lafayette, we Purdue students are thrown into a unique geographical location: 2 and a half hours up north is Chicago, the Bears hometown where half of the football fans in Purdue come from, and 1 and a half hours down south is Indianapolis, where the other half are strongly affiliated with. While the game is played in Flourida, Purdue became the epic battleground for the fans who, being poor college students, root in front if TVs in dorms, apartments and halls alike, to witness the game and lash out whatever verbal encouragement or mudslinging they like. It is one big phenomenal night. And where am I in the midst of all this excitement? Lilly Hall Life Sciences Library. Quiet, calm and full of chromosomes, dosage compensation and this trusty digital asylum. I'll check the score online after the game finishes. Oh, talked to bro just now. Hey, If you read this, and even if you don't believe this sort of thing, I'll pray for your success in finding an internship. Don't really have time to blog nowadays, keep getting stuck in labs in between classes and even weekend nights. 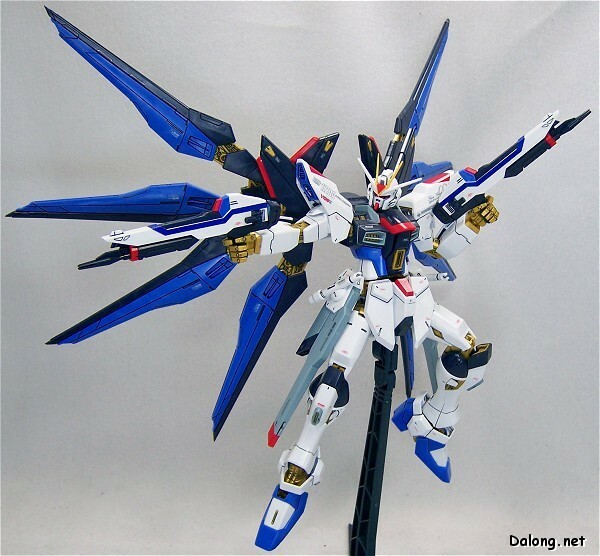 But I'll still write something once in a while, when i have something interesting to share hehe..
Bandai just released the MG 1/100 Strike Freedom Gundam Model!!! It is wayyy better than the previously released 1/100 version; the new model is more accurately and aesthetically matched with the real one shown in anime. What catches my attention is that the model looks really good if I can stand it next to my MG Freedom Gundam. I really want to get my itchy fingers on one so last night i went to Hobbylink Japan and decided, quite spontaneously, that i won't mind spending $40 on the model and $20 on the shipping fee just to satisfy my craze. However, at the last moment, I let my forefinger linger on the mouse without clicking on the 'BUY IT!' button. I was hesitating. I was actually hoping that the currency exchange between USD and Yen will get better before I go ahead and buy it. (FYI, Hobbylink Japan deals its business in Yen. So currency conversions are needed when purchasing its products) My Japanese class Sensei actually told us these few days the Yen seems strong against USD. So.. I tahan a bit lo.. now i have a new hobby: fervently checking the currency exchange rate of USD vs Yen.. now USD 1 = 121 Yen.. hopefully it will grow better!!!! !